This was taken at our local beach. On this day & the couple of days before I took this shot, the sunset was really beautiful. The glow was magnificent & the tide was also very low. Thats a silhouette of my son, and I got him to hold the bottle of water to create a sense of heat that came from the setting sun. The dark corners in the picture is actually the vignetting effect from 18-200mm VR lens on my very 1st D40 dslr. It was handheld and the chromatic aberration was also very evident. You did an excellent and clever use of the camera�s technical settings and got the most of the circumstances. Using the plastic bottle is not useless, it�s been a very smart way to enhance heat sensation. I also cheer your son�s pose with his left hand in the forehead. In short, very good shot. Very spectacular sunset - the colours and light are superb! Composition works well - placement of your son is strong, to the left 1/3rd of the shot. Possibly the only negative is the skewed horizon, perhaps if that was levelled out ...? I'm Speechless.The composition is perfect and i love the color of the sunset. Its one of those photo's one always dream of taking. Congratulations for this superb sunset shot! What a spectacular sky adorned with all the beautiful colors of this daily phenomenon! Great silhouetted human figure of this boy with a sparkling plastic bottle in his hand! Great details on the sand! All makes an artistic presentation. You created, with the help of the sky of course, a great atmosphere here. 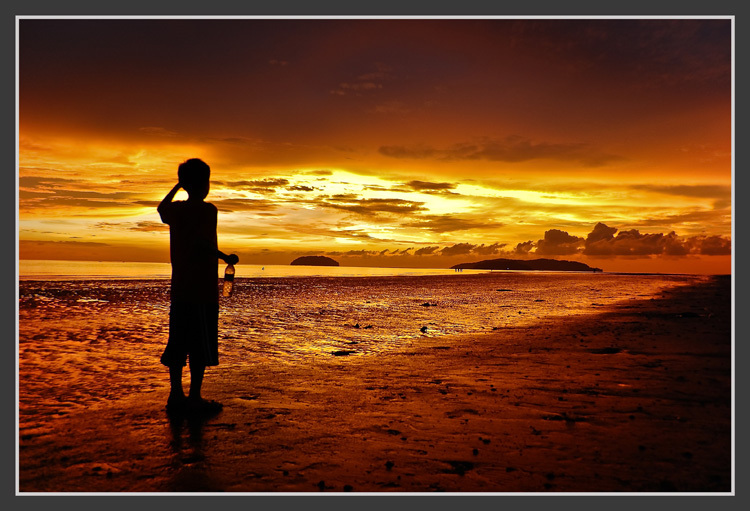 lovely capture,excellent sunset great rich colours and detail,the silhoutte of the boy is placed perfectly. This is beautiful Mike. Love the colours, the title the everything of this photos. It is really meaningful.